Give your bedroom an atmosphere of lived in elegance with this panel headboard. 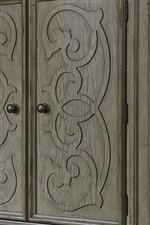 Traditional style elements like the decorative scroll motif and post like pilasters give this piece an air of dignity, while the heavy distressing gives it an antique feel. Bed frame sold separately. 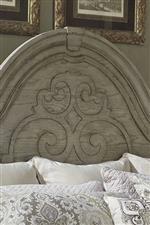 The Grand Estates Traditional King Panel Headboard by Liberty Furniture at Standard Furniture in the Birmingham, Huntsville, Hoover, Decatur, Alabaster, Bessemer, AL area. Product availability may vary. Contact us for the most current availability on this product. Turn your bedroom into an elegant space that still emanates comfort and feels like home with this striking bedroom collection. Ornate details and classic design elements are married with a unique gray taupe finish and heavy distressing to create a timeless lived in feel. Offering plenty of storage space and modern convenience like nightstands with built in charging stations, this collection is exactly what you have been looking for to help construct the bedroom of your dreams. 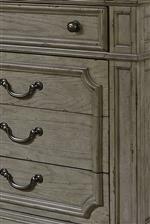 The Grand Estates collection is a great option if you are looking for Relaxed Vintage Traditional furniture in the Birmingham, Huntsville, Hoover, Decatur, Alabaster, Bessemer, AL area. Browse other items in the Grand Estates collection from Standard Furniture in the Birmingham, Huntsville, Hoover, Decatur, Alabaster, Bessemer, AL area.